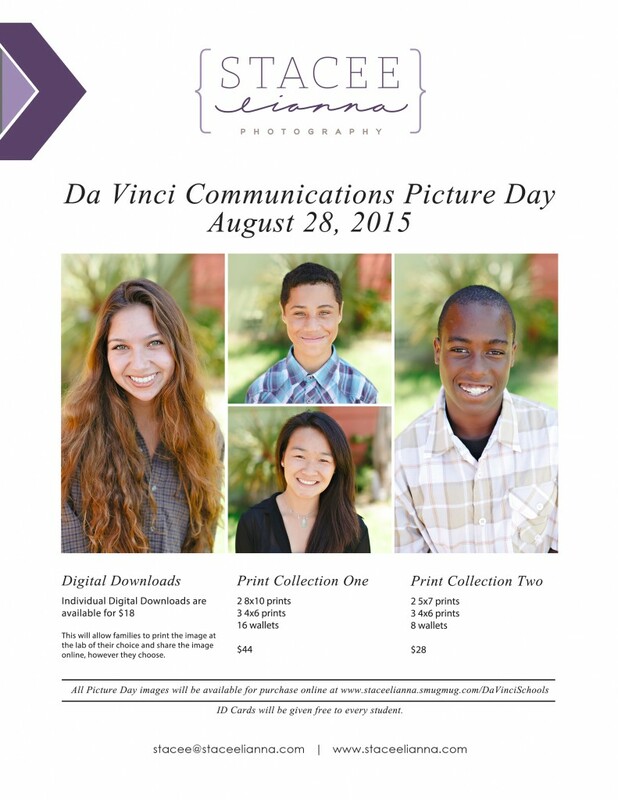 Picture Day is tomorrow, come dressed to the nines! Back to School Night – Tonight, 6pm – 7:30pm! Attention all Musicians interested in joining our Da Vinci Jazz Orchestra!!! What: This exciting ensemble will perform a varied repertoire of pop, rock, r&b, jazz, film, classical, and world music for several concerts, civic events, exhibitions, festivals, commencements, and possibly theme park performances over the course of this school year. Who: Any musician with one or more years of experience playing a wind, string, or percussion instrument is welcome to join. Also, much of our repertoire will have vocal parts. So, singers are welcome!! Experience reading, no matter how rusty, is preferred, but not crucial. When: Our first group meeting will be on Friday September 11th, in the DVS Forum, from 8-9:30am. DVD/C students will meet Wednesday mornings 8-8:50 in the DVC Music Studio, and on Friday mornings 8-9:30 in the DVS forum. DVD/C students will need permission to walk back to campus for their 10am classes-Please get a permission slip from Toby, and have it signed prior to Sept. 4th!! Back to School Nights is this Wednesday, August 26th from 6pm to 7:30pm. Come meet your student’s teachers hear about the classes they will be taking. The Overnighter will take place Thursday September 3rd through Friday September 4th. Ninth grade students will come to school at the normal time on Thursday – 9am, and leave from Da Vinci Communications around 9:30am. We will spend the night at Camp Conrad Chinnock by Big Bear Mountain, and then return to campus Friday afternoon. All students will be dismissed Friday at the normal dismissal time – 3:55pm. Seminars (our student electives that take place the last hour of the day Monday through Thursday) will begin on September 8. In the next week or two we will release the seminar list and descriptions for students this year. Students will receive a hard copy and you can access a copy posted to the blog so that you can discuss with your students and they can make a great choice. 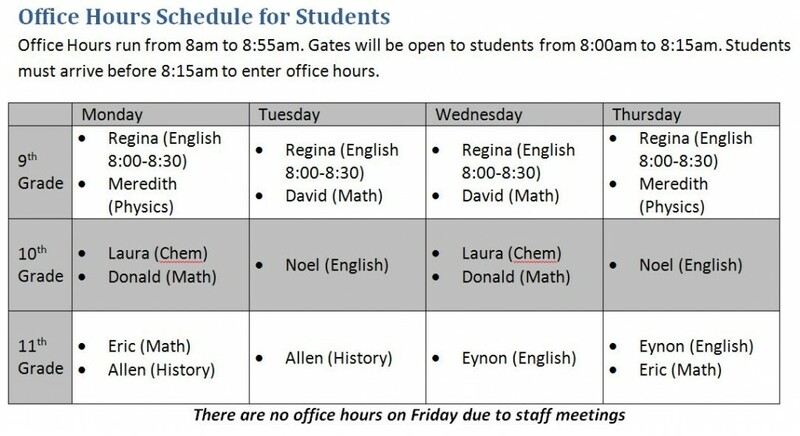 Office hours began today – here is the schedule for when teachers will be available for Office Hours. The first day of school is Tuesday, August 18th. Gates will open at 8:50am and school will begin at 9am like a normal Tuesday. Office hours will begin week 2 of school, so for the first week we will not be opening campus until 8:50am. 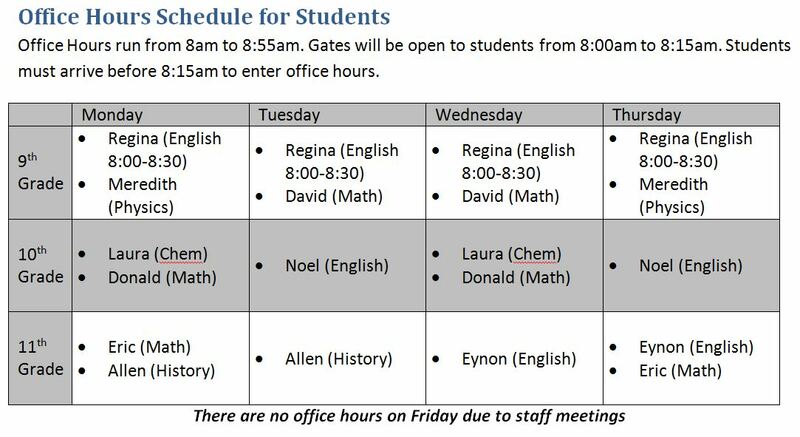 Starting week 2 we will open the gates from 8:00am to 8:15am for students to come into office hours, then again at 8:50 for the start of the school day. When school begins day 1, students will enter through the front office and head to their advisories. We will post students’ names on their advisory doors, and there will be teachers guiding students to their classes. Students will receive their schedules during their first advisory class on the first day of school. Remember to follow dress code – collared shirts or Da Vinci shirts and appropriate pants or bottoms (no gym shorts or sweats). Seminars will begin on September 8. Students will all receive seminar descriptions during the second of school and they will also be posted to the blog families can discuss seminar options together. DVC now has a separate office accessible from the back parking lot by the field. At the beginning and end of the day (8am, 9am and 4pm) through either the front entrance used last year, or through the new entrance by the DVC office. You may still drop your student off in front of the school. DVC students arriving after 9am or being picked up before 4pm must enter or exit through the new DVC office. If you have school business during the day, you should come to the back parking lot and to the new DVC office. Teachers have put together their materials lists for the year. We ask that students gather these materials by the end of the first week of school, but having them on day 1 would be very useful! Back to school night will be August 26th from 6pm to 7:30pm. Come meet your child’s teachers and see the campus! More details will be put out once school begins. It was great meeting all the students and families who came in during summer bridge week! A big thank you to Brittany, our school counselor, who organized summer bridge, and all of our 10th and 11th grade student mentors who were here this week introducing new students to DVC. WOW! Thanks for the quick and overwhelming response! For those who responded to me, I will be sending you an email with location and time information. Denise and I thank you from the bottom of our hearts. First, let me welcome all the new Communications families and welcome back all the seasoned Communications families!! The first day of school is right around the corner and we, as parents, put together Welcome Baskets for our new and seasoned teachers every year.